We have a lot of exciting things going on at Fields Foods and we want to share it with you. 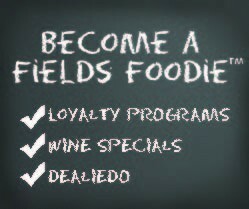 Become a Fields’ Foodie to get the latest information about our weekly food and wine specials, featured products, in-store tastings and events, Wine Explorers Club, and much more. Please sign up below to receive email updates on the latest happenings, exclusive offers and specials at Fields! Also follow us on Facebook and Twitter to stay in the loop. We know that the right wine or beer can take a meal from ordinary to extraordinary and we’re all about helping you find the right pairings at affordable prices. We have a wide selection of wines and beers for you to choose from and we’ll be sharing a new featured wine weekly that we think is simply too good for you to miss! Each month, we’re also offering a special package of wines from artisan producers – both domestic and abroad – at discounted prices. We will include detailed information on the producer, the wines and the region as well as easy-to-follow recipes from the area so that you can create an authentic regional dining experience at home. We’ll also be hosting free in-store wine tastings regularly so don’t get left out! Sign up now to find out the latest.